and articles from our “Museums-Shop”. UID: ATU46676707. Place of jurisdiction Vienna. We charge article and special tour prices which are in effect of delivery day or the day of the service. Accounting of performance is based upon the corresponding offer. Exceptions in particular case must be in written form. When the agreed payment period is exceeded we will charge interest for delay as well as prompting dunning charges. The invoice amount includes the respective tax rate. 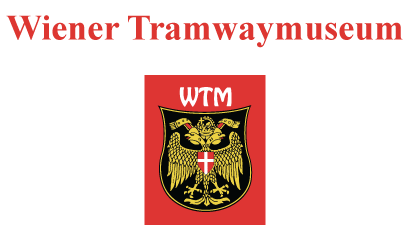 The “Wiener Tramwaymuseum” is a non-profit association with the focus to maintain historical streetcars of Vienna and does not strive to raise profit. Article prices of the “Museums-Shop”, are always listed as gross prices including legal value added tax. Packaging, cargo, customs duty and possible insurances are not included and will be charged separately. Prices are subject to change depending on the market and will be changed accordingly without warning. In case of price increases we will get in touch before shipping goods. There is money-back guarantee – which means a return just of basis not liking is not possible. All offers are valid while stocks last. We are keen to have everything in stock, but can’t guarantee it. Ordered special tours can be canceled complete or partial up to three workdays (Monday till Friday, if not a holyday in Vienna) before time of tour without cancellation fee; if canceled up to two days in advance 50% and if canceled on the day of the tour the complete invoice amount becomes due. For additional services like catering, flower décor, musicians, guides, photographer, and so on, there is following cancellation charge for complete or partial cancellation: Between 14 and 3 days before the date of the service: 50%, for later cancellation 100%. Ordered material, like posters for billboards beside the entrance, on the windows or the roof can not be cancelled and must be paid in any case. In observance of copyright, image rights and trademark rights of us and our partners all publications like invitations and other announcements regarding your tram ride or regarding your event in the “Verkehrsmuseum – Remise” and Museum Depot Traiskirchen, which is organized by us, have to be checked and approved by us. In particular you have to clarify with us the use of pictures of streetcars, tram depots, tram stations, tram tickets, logos and other objects which belong to the public transportation and also the text of your publication. The allowance from us will be in written form including the allowance of our partners. If you don’t request such a written allowance, the use of pictures, logos and words (even only in extracts) from us is just as forbidden as the not allowed use from pictures, logos and words of our partners and you will be liable in case of violation of such rights. We assume no liability for the realization of a special tram tour in total or only on a changed route in case of force majeure or in case of a general driving ban, decreed by “Wiener Linien” (Viennese public transport company), e.g. because of an event, demonstration, etc. 1. Punctuality is the first commandment for a railway system. Please make sure, that you and your guests are punctual at the appointed time at the starting point. It is always better to be there a little bit earlier than too late, because we cannot wait for latecomer as we are not allowed and also not willing to constrain public trams. If we arrive later at the appointed tram station, please consider that line operation has priority and that we have to arrange with it. In case of failure or very late arrival of a special tram because of operational or traffic reasons or in case of force majeure the client cannot claim compensation. 2. If your tour starts or ends at the tram depot, please be aware that you have to keep off the railway property, which is not determined for public because of security reasons. Starting point is always the public tram station nearest to the tram depot. To step in and out is only allowed at official tram stations. Keep off the railway property, personally and with private cars or bicycles. If you ignore this forbiddance, you can get an action of trespass from the “Wiener Linien”. 3. Using the trams and the rails the behavior of you and your guests has to be in accord with all security rules, regulations and terms of transportation. 4. Please consider that you drive with historical invaluable and irreplaceable museum trams and use them according to this. Each reinstatement work of a damaging of these historic trams is much more expensive than of regular trams. These costs you have to pay. The use of our billboards (outside, beside the entrances – at nearly all wagons) for poster in the format 60 cm lenght and 75 cm height is an additional service from us. Rental of these billboards and fixing your posters by us is free of charge! Thank you for your understanding that we assume no liability for display material, which was provided from you. Not allowed fixing of posters, stickers and decorations material of each kind (like garlands, flower arrangements etc) inside and outside is forbidden! 6. Using signaling devices and warning devices is strictly forbidden (bell pull, alarm whistle)! They are only for the communication of the train personal and can cause accidents in case of abuse. 7. While driving it is forbidden to step in or out, to stay on the footboards or to open the entrance doors. It is also forbidden to lean out the wagon or to jut out parts of the body or other objects or to throw objects out. 8. Each passenger has to fix his footing during the whole ride. The passenger bears the consequences of personal injury because of ignoring these protective measures. Keep in mind the possibility of an emergency braking. 9. If you want to open or shut a window please contact the tram team. Smoking is allowed if all passengers agree. Please take care of keeping the wagons clean and of disposing of potential waste. In case of pollution please contact the tram team. 11. Orders of the tram team and of supervisors of the “Wiener Linien” have to be obeyed. 12. We keep objects, which were lost or left in our tram wagons for one month. Please contact our office per phone – Vienna 786 03 03. If you attend to all mentioned points, for you and your guests it will be a beautiful and unforgettable experiance with our historic trams of the collection “Wiener Tramwaymuseum”. Thanking you in anticipation for your understanding. Have a good trip and have fun!